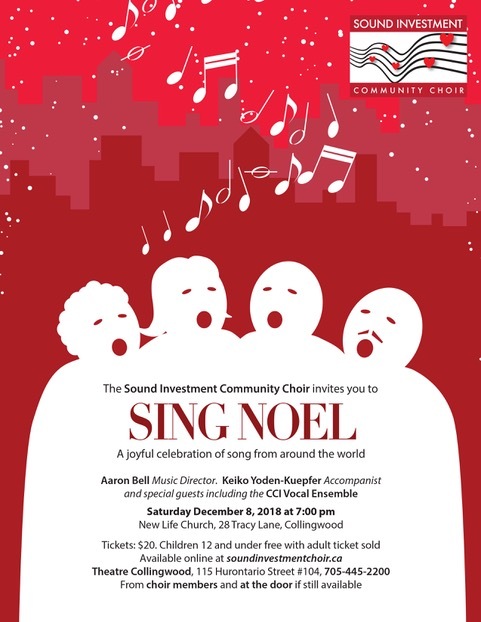 In early May The Sound Investment Community Choir will be hosting a choir called Septini Sapni from Latvia for a few days as they prepare to sing a concert of their music for our community. We will join in the fun of singing together sharing some of our Canadian music with them. The concert is planned for Tuesday, May 7th, 7:30 p.m. at the Trinity United Church in Collingwood. Septini Sapni “(translated as "seven dreams") was formed in October, 2011 by a group of individuals in the City of Dobele, Latvia who wished to sing choral music and traditional folk music. The conductor is Raimonds Bulmere, a local high school music teacher and the accompanist and featured soloist is Sandra Bulmere another local music teacher. The choir currently has some 44 singers, 36 female and 8 male, with an average age of 40. The choirs’ repertoire includes traditional Latvian folk songs, current works by Latvian composers along with classical choral works. The choir is entering its eighth season with rehearsals weekly in the city’s youth and wellness centre. The choirs’ first objective was to qualify to participate in the XXV Latvian Song and Folk Dance Festival in Riga, Latvia in 2013. The qualification process required the choir to be adjudicated in a national competition with other choirs by the selection committee from the Festival. Over the years the choir has participated in numerous World Choir competitions in various European countries and in 2014 participated in the European Choir Festival in Ohrida, Macedonia and in 2016 in Kazanlaka, Bulgaria. This year the choir qualified to participate in the XXVI Latvian Song and Folk Dance Festival in Riga where over 14,000 singers and 16,000 dancers performed to sellout crowds. To qualify the choir rehearsed diligently weekly for 5 years to master the difficult repertoire which was very challenging for amateur singers. Every year Septini Sapni participates in local choir competitions, concerts and performs many charitable Christmas concerts. To establish and maintain relationships the choir organizes yearly friendship concerts in Dobele inviting other choirs to join them.